This was the first time we planned on going out for Thanksgiving and I had mixed feelings. I have always had a home cooked Thanksgiving meal for as long as I can remember. Turkey, mashed potatoes, gravy, sweet potatoes, apple pie... mmm. In the past few years, I have been in charge of the delicious roast turkey and I wanted to do it again. However, this past holiday, with young toddler and our crazy life getting in the way, there was no way I was able to cook a full Thanksgiving meal for my family and my parents-in-law. Seriously, it was the best decision that we made. No dishes. No clean up. No leftovers (good and bad). 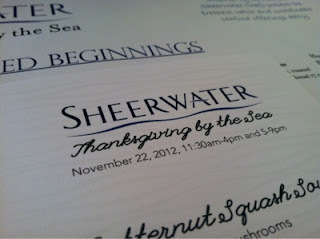 The meal at the Sheerwater Restaurant at the Hotel Del Coronado absolutely divine. DELICIOUS. The theme at Sheerwater was "Thanksgiving by the Sea" and the cost of the meal per person was $37.50. We were able to select a soup or salad to start, an entree, and a dessert. The price was not bad for a three course meal at one of the best hotels in San Diego. Between the four of us adults, we were able to order everything on the menu, but the salmon. It was a nice coincidence without me trying to influence my hubby and the in-laws that we shouldn't get the same thing. Right? 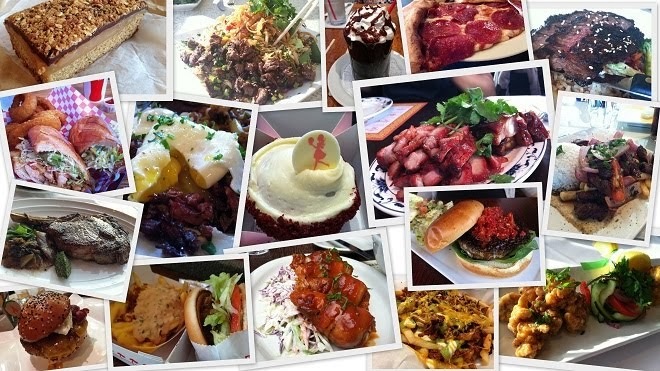 You understand, food bloggers. I ordered the butternut squash soup for my first course. The soup was amazing. I loved every flavorful spoonful. Each bite was warm, smooth and creamy. 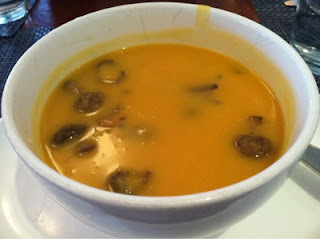 The flavor of the soup was sweet and nutty. There was nice texture from the wild mushrooms in the soup. My son enjoyed the soup as he sat on his Nana's lap. The Bloomsdale spinach salad came with caramelized pears, crumbled bleu cheese and a honey vinaigrette. I had a bite and it was good. The Bloomsdale spinach was fresh and buttery. 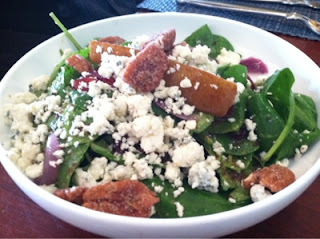 The dressing added tang and the sweet pears toned down the flavor of the cheese. 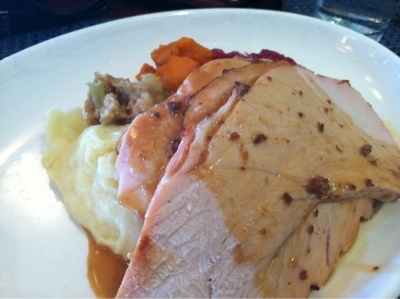 For the main course, I chose to be traditional and ordered the slow roasted smoked turkey entree. My turkey dinner came with three generous slices of dark roast turkey meat, giblet gravy, yukon gold mashed potatoes, cornbread stuffing, brown sugar sweet potatoes, brussel sprouts, and orange scented cranberry sauce. Oh my gravy, I am still drooling thinking of this meal. The turkey was super moist to the last, last bite of the final slice. It was amazingly good and cooked to perfection. All the accompaniments were equally delicious in flavor. I am not a fan of cranberry sauce, but it still was tart and really good. 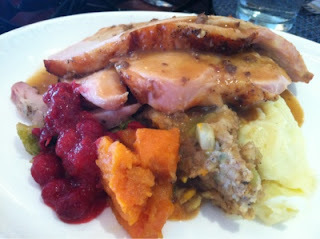 I wished they served more mashed potatoes but the sweet potatoes did the trick in terms of more starch with my turkey. 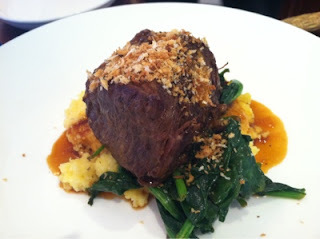 The hubby ordered the braised short rib with organic stone ground polenta, spinach and citrus jus. The flavors of the short rib was pretty good, however I thought that the short rib could have been braised a little bit more. The meat didn't melt in my mouth and it was a bit dry, but like I said, it still was good. The flavor of the meat with the polenta and spinach went really well. 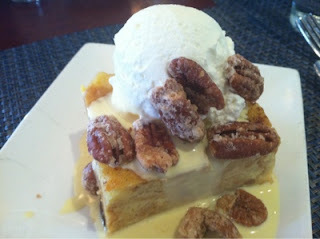 For dessert, I ordered the pecan bread pudding with candied pecans, fresh whipped cream and a bourbon creme anglaise. It was the perfect end to our Thanksgiving meal. I could have eaten a bowl of those sugary, candied pecans alone. 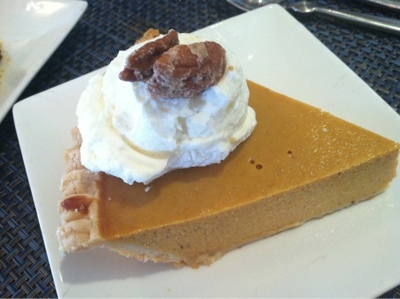 Here is the spiced pumpkin pie with whipped cream which my mother-in-law had. It was simple goodness. 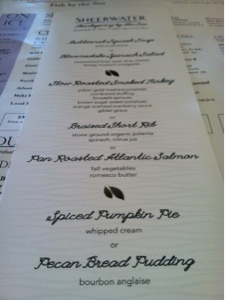 Thanksgiving, away from home, was absolutely delicious and worth every penny. This year, I should be able to home cook a Thanksgiving meal for my family, but we always know where to go if something comes up! Hi everyone! This is Crystal and I’m back for my second guest post! 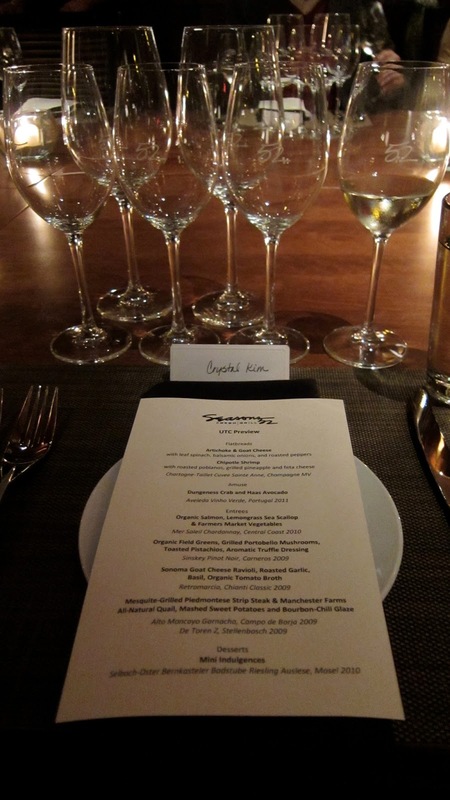 I am so excited to share with you yet another fabulous media preview dinner I attended. Seasons 52 recently opened at University Towne Center (UTC) in La Jolla on November 19th, and is the second location to open in California (first one is in Costa Mesa). Janice was one of the lucky guests who received an invitation to the Seasons 52 Preview Dinner by Marguarite Clark Public Relations. Janice extended the invitation to me and I accepted with a huge smile on my face. 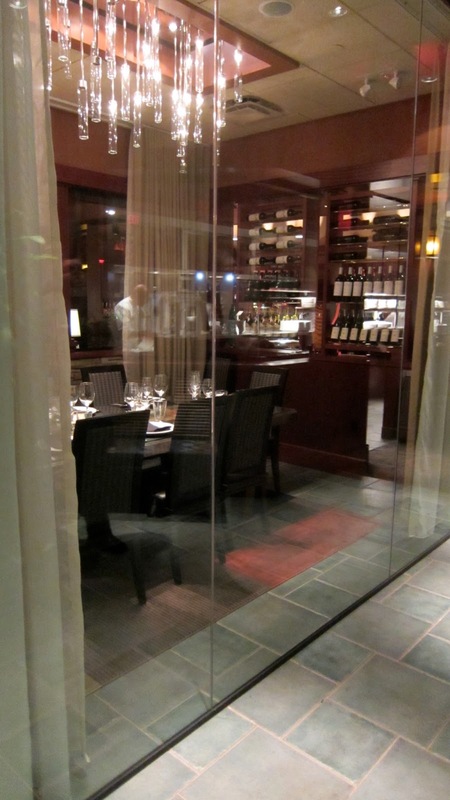 Seasons 52 is a “fresh grill and wine bar restaurant” that focuses on using farm fresh ingredients to create a unique and innovative menu that complements the changing seasons. If I had to describe the concept of Seasons 52 in six words it would be: Local Farmer’s Market Meets Fine Dining. Sustainability has taken some root here in San Diego and it seems as though the public is truly learning to appreciate food that is grown and prepared in a way that is conscious of the environment, as well as our personal well being. If the birth of another sustainable restaurant in this beautiful city does not have you jumping for joy, then this next fact will: every item on the menu is under 475 calories! Yes, you read that right. Now that I have your attention, I will take you on a visual journey through the experience that left me speechless. Gorgeous. I already knew the ambiance of the restaurant was going to be filled with “ooh’s and aah’s” when I reached my destination. The “Chef’s Dining Room” is located towards the front of the restaurant, and neighbors the kitchen and private wine cellar. The wall inside features a rack of spices that creates an aromatic accent to the fabulous room. Fancy! 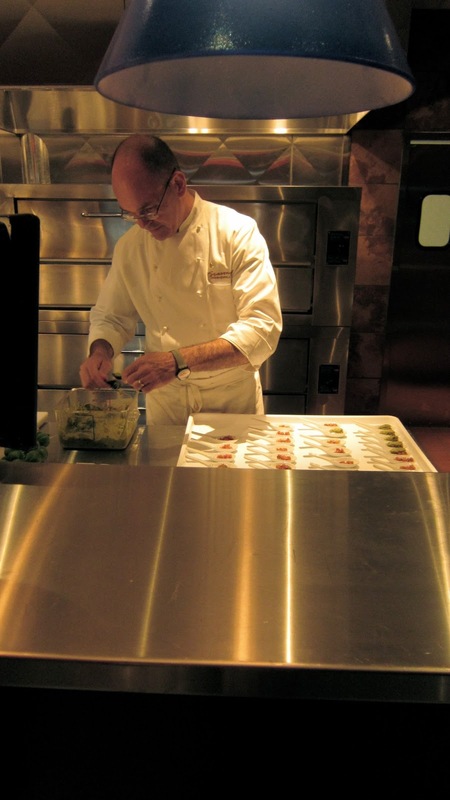 We took a tour through the “open kitchen” that is visible to patrons while dining. All the magic is created right here, folks. That is a picture of the award-winning chef, Clifford Pleau, who is the mastermind behind it all. Another fact I want to share with you is that all the cooking at Seasons 52 is done on a grill that is fueled by wood. Truly sustainable, right? Moving on from the kitchen to the private dining area, Field Sales Manager Rachel Spillane described the “Napa Room” and “Sonoma Room” which can be reserved for your next event! Directly outside these rooms is the patio, which is open to all patrons and is the perfect place to lounge and enjoy cocktails by the fire. First taste of heaven! 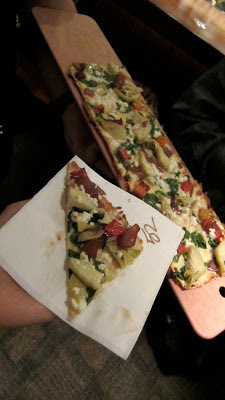 The flatbreads were passed around by the server while everyone gathered near the bar, waiting for Grand Master Sommelier George Miliotes to officially host the lovely evening. We were directed into the main dining room where each seat was adorned with seven wine glasses and personalized name cards. Lovely! 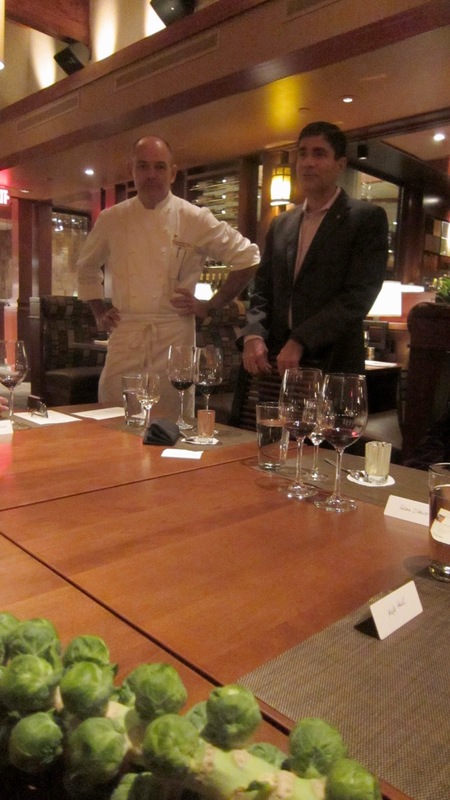 For the rest of the evening, Chef Pleau and George continued to shower us with wine and cuisine knowledge. The salmon was cooked on cedar plank wood. The meat was soft, juicy, and cooked to perfection and married so well with the scallop. It was divine! The salad entrée was presented using a hollow glass cylinder directly onto the plate. Very unique. The smokiness of the caramelized portobellos and truffle dressing complemented the simple field greens. Easily one of the best salads I’ve ever had. This dish needs no words. Fireworks in my mouth. Oh goodness, the strip steak. Cooked to the perfect shade of doneness and soaked in the bourbon-chili glaze. I wasn’t a fan of the quail, however, I thought the texture was a bit rubber-y. Here is a picture of a lovely stalk of brussel sprouts which the chef let me take home. I am not much of a dessert person but it was hard to turn down these “mini indulgences” because they are so aesthetically appealing! Dessert was paired with yet another glass of wine (but, of course), Selbach-Oster Bernkasteler Badstube Riseling Auslese, Mosel 2010. 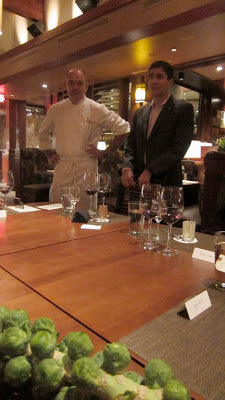 Again, thank you to Chef Clifford Pleau and Grand Master Sommelier George Miliotes for a spectacular evening! I want to especially thank Marguarite Clark Public Relations for the invitation. I can easily say without a doubt that every dish on the menu that night was nothing less than excellent. I still cannot wrap my mind around the fact that everything is under 475 calories. Truly amazing! My taste buds are yearning for that perfectly cooked pink salmon!